My experience was great. I walked in and talked to Rick. Rick is down to earth and genuine. I didn’t feel like I was being sold with some sales pitch. He walked me through everything like a friend. I felt if I known him for years. My credit wasn’t the best and he got me approved. I’m very satisfied. Great deals, even better salespeople. Very professional, especially Luis Martinez, he helped with all my buying needs. 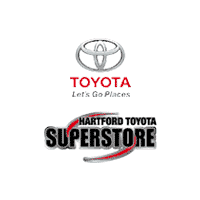 After emailing with Patricia Foxx, we decided to go to Hartford Toyota to check out a Highlander Limited. Successful purchase and happy to drive home in a new SUV. TIme delay between agreement to purchase signed and financial meeting as the dealership was down one finance employee. Rick Reid was able to work with us to put us into a brand new car! He asked us questions to know our situation and found us options that worked for us without a lot of back and forth. We would recommend our friends and family to speak to Rick the next time they are looking for new car. We look forward to working with Rick again in the future! Rick took the time to show us all the functions of our new vehicle which was greatly appreciated! He even hooked up my bluetooth to my phone and booked our first service appointment. Rick gave us a full tour of the facility and took the time to answer all our questions. There were no surprises when we came back to seal the deal. Marc had all our paperwork ready to go, so there was no waiting. I will like to thanks Luis Martinez for the service he provided explaining the process to buy my new car and show me and explain all the features in my car thank you Luis and I recommend him any time.